Since the ousting of Tunisian President Zine El Abidine Ben Ali in January and onwards our TV screens have been filled with images of the Arab uprisings, from Egypt to Jordan to Bahrain to Libya and increasingly to Yemen. But what has really struck a chord when looking at the reports is the way that UGC has been used or hasn’t been used. This video on youtube was used in a channel 4 news broadcast ( but CNN have loaded this version onto youtube). It shows an Egyptian police van running over civilians. This is the power of UGC. In a world where everyone has a mobile phone, every dark deed can be captured whatever the restrictions on journalists, and the light can be shone on truths that would have otherwise been missed. UGC also presents a problem for the reporters on the ground, who are trying to navigate their way through the protests and find stories which bring the issue alive. In the ‘age of information’ editors back in London, New York, Doha or wherever can see everything from all kinds of sources before the reporter can. Editors can direct reporters to include shots, or UGC or information not gathered on the ground themselves. This prescriptive top down reporting negates the role traditional of a reporter and instead makes them more of a curator or compiler of information. Jon Snow has written about this very issue this week in PORT magazine. “Where once I was one pair of eyes witnessing a story and sending my account back to London, I am now charged with retrieving the work of many pairs of eyes and putting together an apparently holistic account of an event. We call this “sausage machine telly”. In the competitive multiplatform age in which we live, this age will not last long. Why not? Because it is neither distinctive, nor is it particularly interesting. This ‘sausage machine telly’ is exemplified here in an ITN report from Libya. Except it isn’t…as it explains foreign journalists are banned from trouble spots (unlike Eygpt) and mobile phone networks and the Internet have been cut so the report relies solely on UGC and a voiceover to tell the story. I’m not saying that UGC isn’t both compelling and useful but we must be careful how we use it. The role of a reporter is an important one, they are trained to find stories on the ground at short notice and to bring a human element to the news. UGC can be very useful in places such as Libya because of the restrictions placed on journalists. UGC can provide the pictures from even the most closed off parts of the world…the problem is how we verify it and interpret the images. Here is a report from Sky’s Alex Crawford RTS Journalist of the year who got into Zawiyah in Libya and filmed this report. It is all the more powerful for a trained reporter putting the story together and automatically trustworthy for it and exactly the sort of journalism that Jon Snow is praising in this account of his work in Haiti. Traditional journalists and cameramen are still very important as you can see with the difference between ITN’s and Sky’s reports. However UGC is a fantastic addition to a reporters toolbox, but one that must be used in addition to solid reporting not in place of it. 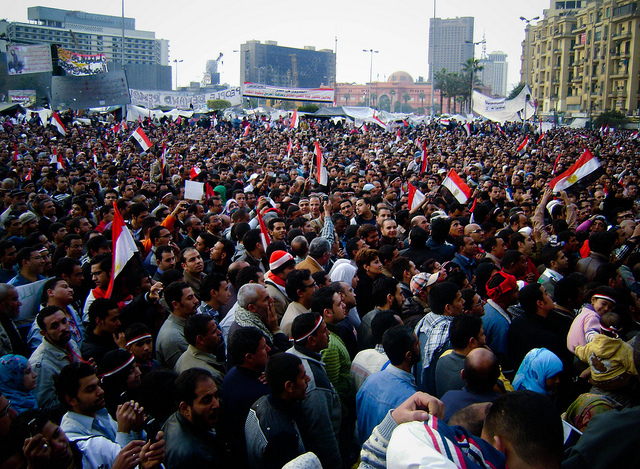 Egypt has been dominating the headlines and trending on twitter for the last week. The latest in the series of so called ‘twitter revolutions’ that have brought change from Moldova to Iran to Tunisia and is now in the land of the Pharoahs. But are we overestimating the impact of Twitter and Facebook? Also as journalists as we too reliant on tweets coming through from hard to reach places? Firstly, Twitter and Facebook don’t bring about or even inspire revolutions, they aren’t out there on the streets egging on protestors. Social Media helps people to shout a little louder and it’s interesting to see that governments are pretty keen to shut them down or block them off (Iran tried and Eygpt plain severed the Internet). But I’m pretty sure that the tens of people that have self-immolated, and the hundreds of thousands that have protested across North Africa these last weeks didn’t do it for the tweets. But as a genuine protest against their autocratic governments based on long term greviances, excacerbated by rising food prices and unemployment. While Twitter is very useful for real time updates from rapidly emerging situations – how much can we trust what information is put out there? During the Iranian revolutions when foreign journalists weren’t allowed to enter the country Twitter became one of the key sources of information for foreign news services. But who are we to trust? In his latest book ‘The Net Delusion’ Evgeny Morozov says that twitter and facebook are actually not the ‘freer’ of people but can instead be used to covertly spread disinformation and tighten government control. So if governments are sometimes using Twitter to further their own aims and severing or shutting down the internet during protests who exactly is getting this information onto the Internet? Blogs, twitter, facebook and youtube are all ablaze with new updates and startling videos. Yet western journalists who couldn’t reach or didn’t bother to reach people on the ground in Iran, just scrolled down the English tweets searching for #mubarak #egypt or #iranelection and getting whatever info there was. It just seems like lazy journalism. I accept that Twitter and Facebook are useful for mobilising the diaspora of a nation that is under going rapid political change as well as rasing the international profile of their movement. It just doesn’t seem like it is the best way to report on these events after all wouldn’t most people involved be tweeting in Farsi or Arabic? **Since posting it turns out that google have introduced a voice-to-twitter service to help Egyptians to continue tweets during the protests. We had a chat with Karl Schneider, editorial Development Director of Reed Business International, about how his publications are using UGC. He told us that User generated images are the most widely used form of UGC across his Business to Business publications. They use UGC because RBI is comprised of niche publications. It is therefore often more beneficial to use user content as it is their users that have the most knowledge and access to niche subject matters. He gives a great example..Farmers Weekly live-tracked the spread of crop disease with data collected and mapped by users. UGC was then effectively helping save farmers crops. By providing more accurate and speedy updates issued by farmers themselves, they were able to share and spread information much faster and more efficiently than traditional media. It could therefore be said that publications can benefit hugely from their audience’s specialist knowledge. Stephen Jio is Global Mobility Online Merchandising and Content Manager at Dell. He told us that Dell’s most valued form of UGC is customer reviews and ratings on products they offer. They find that their users trust other users more than they trust a big corporate company. He also tells us why he thinks UGC is making the media more honest.